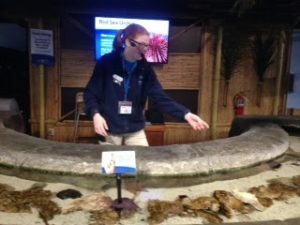 Exhibit Interpreters engage guests with educational information and experiences that go beyond the aquarium glass. Exhibit volunteers must be 18 years or older and willing to commit to 8 hours monthly. This is ideal for individuals with strong communication skills, who love to learn and want to interact with a diverse group of people. Exhibit interpreters receive training to engage our guests and answer questions about everything within the aquarium, interpret exhibits and staff hands-on stations. The Exhibit Interpreter Program is currently at capacity. We encourage you to submit an application to be kept on file for when positions become available.. Applications completed online will be automatically submitted to the WAVE Foundation’s Community Engagement Office. Should you have any questions regarding the application or any of the volunteer programs, contact us by emailing volunteer@wavefoundation.org or calling 859.815.1424.